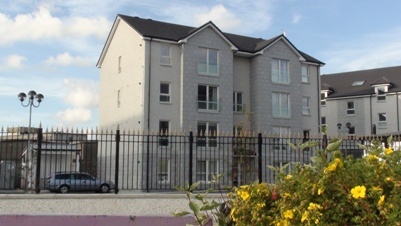 City Mount is a family run, smoke-free, 2nd floor rental apartment in a semi-gated complex, close to the city centre of Aberdeen, with private parking, on city centre bus route and airport bus route, within 1 mile of the railway/coach/ferry terminals and 6 miles from Dyce (Aberdeen) airport, and walking distance of Aberdeen University. The apartment comprises an en-suite double bedroom, a twin bedroom, large family bathroom with bath & shower, and open plan TV lounge, dining area and kitchen with full self catering facilities (oven, microwave, fridge, freezer, washing machine, dish washer, kettle, cutlery, crockery, etc. ), large screen 3D SmartTV and free Wi-Fi internet access. Full gas central heating; double glazed; video security entry system; bike lock-up area; car wash area. Morrisons Supermarket is nearby. Chinese restaurant on your doorstep and just 1/2 mile walk into city centre shops. Convenient for Whisky/Castle/Coastal Trails, Royal Deeside and Scottish Highlands. Please note, City Mount is a pet free and NO SMOKING establishment. Download our Summary Flyer (Acrobat Reader Required). Gorgeous flat, easy access to the Theatre & thank you for stocking up the fridge etc with essentials before we arrived. It made the 1st few days we were here even more enjoyable! If we're ever back in Aberdeen we'll definitely be staying here again. Lovely, comfortable flat with easy access to the sports village for a swimming competition. Thank you for stocking up on necessities for our arrival. Very thoughtful.